A special meeting of the Policing Board has been called in the wake of the controversy over the Police Service of Northern Ireland's (PSNI) failure to disclose legacy files to the Police Ombudsman. The board asked for - and has received - an urgent report from Chief Constable George Hamilton on the issue. Board members will meet on Tuesday next week to discuss the report. The Policing Board is facing a number of key decisions. First it must decide what it is going to do about the files controversy. 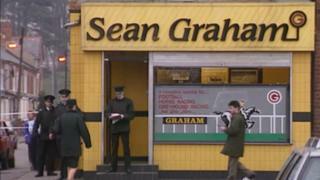 It emerged last week that the PSNI had found files relating to the Sean Graham bookmakers shop attack - they should have been handed over to the Police Ombudsman. Five people were killed in the attack in south Belfast in 1992, carried out by the Ulster Freedom Fighters (UFF). The Policing Board is also looking at the recruitment of the next chief constable. Mr Hamilton has announced that he intends to retire at the end of June. On Monday, Sinn Féin president Mary Lou McDonald indicated an outsider should replace Mr Hamilton. In response, Democratic Unionist Party (DUP) leader Arlene Foster said the recruitment process had been compromised by the comments. The Equality Commission and the Police Federation also expressed concern. The Policing Board is taking legal advice about the implications for its process. On Thursday, Sinn Féin MLA Raymond McCartney said confidence in the PSNI among nationalists is at "rock bottom". Mr McCartney said this could have implications for recruitment.